DENVER, Colorado, August 8, 2015 (ENS) – The U.S. Environmental Protection Agency has confirmed that its workers caused the spill of one million gallons of wastewater from an abandoned mine in the mountains of Colorado. The EPA workers were using heavy machinery to investigate pollutants at the Gold King Mine, north of Silverton, when they breached a strip of raised land, and the toxic water flowed into the Animas River. 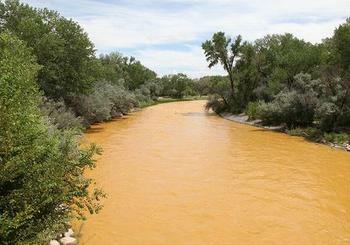 The spill turned the river a mustardy-orange color, and officials warned Thursday that contaminants threaten water quality downstream. The creek eventually drains into the San Juan River. “Initial estimates are that the release contained approximately one million gallons of water that was held behind unconsolidated debris near an abandoned mine portal,” the EPA said. There were several workers at the site at the time of the breach, all were unharmed. “This unfortunate incident underscores the very reason EPA and the State of Colorado are focused on addressing the environmental risks at abandoned mine sites,” said David Ostrander, director of EPA’s emergency response program in Denver. The primary environmental concern is the pulse of contaminated water containing sediment and metals flowing as an orange-colored discharge downstream through Cement Creek and into the Animas River. The Colorado Department of Public Health and the Environment has notified water users downstream of the release so they can take appropriate steps to turn off intakes until the contaminated water passes. The Town of Silverton does not take water out of the affected portions of Cement Creek. Due to current and longstanding water quality impairment associated with heavy metals there are no fish in the Cement Creek watershed and populations in the Animas River have historically been impaired for several miles downstream of Silverton, the EPA said in a statement. Over the next several days, EPA teams will be sampling and investigating downstream locations to confirm that the release has passed and poses no additional concerns for aquatic life or water users. In a statement Saturday, the federal agency said it is providing technical and laboratory assistance. Tests have found an elevated concentration of acid and higher levels of copper, zinc and manganese in areas affected by the spill, the EPA said. The five drinking water systems that might be impacted downstream in New Mexico have closed off intakes from the river and will not draw water again until the quality of water samples improves, the EPA said. The water systems can store water or use alternative sources, the agency said. The nonprofit Center for Biological Diversity blasted the EPA for downplaying the possibility of impacts to fish and wildlife from the spill. The San Juan River in New Mexico and Utah contains habitat for several species of federally endangered fish and birds. Many of these, including razorback suckers and Colorado pikeminnow, are already afflicted by exposure to toxic compounds, such as selenium and mercury, associated with mine waste.